Skycaddie is one of the most famous names in the manufacture and distribution of golf wearables. This popularity comes from the fact that they have simple and easy to use devices that do not require any prior experience. Although Skycaddie golf GPS has all the essential features that you would find in their other devices what I liked most about it is that it has other special functions that you can use even when not playing golf. Skycaddie is one of the most famous names in the manufacture and distribution of golf wearables. This popularity comes from the fact that they have simple and easy to use devices that do not require any prior experience. Although Skycaddie golf GPS has all the essential features that you would find in their other devices what I liked most about it is that it has other special functions that you can use even when not playing golf. Some of these outstanding features include an odometer and calories counter, and most people will find something to do with them. Preloaded Courses: It comes preloaded with more than 29,000 courses from around the globe, and it also allows you to update the course maps. 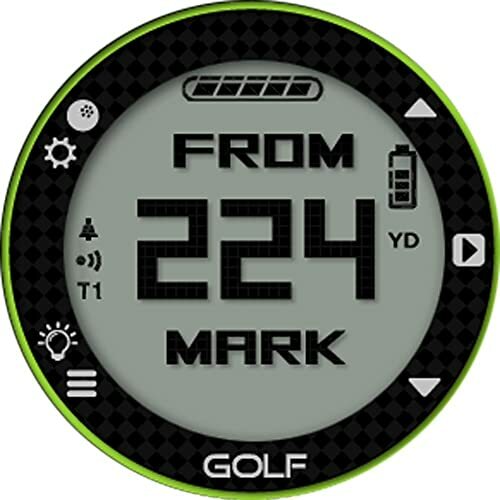 Measurement: Measures back, center, and front distances on the green accurately and displays them in a big font for easy visibility. Odometer: An odometer on your hand will come in handy on several occasions on and off the course. Apart from this, the watch also has a calorie counter and a lap counter. Extras: The watch also has a clock, timer, backlight and also the option to choose between English and French as your language of use. Colors: With GPS device you have the possibility to make a choice between black and white. These are the two colors that golfers prefer on their wearable devices. Screen: This watch has a 1.05 inches screen which is bigger than most watches in the same category. Apart from this, it is also very clear making it possible to read it even under severe weather conditions. 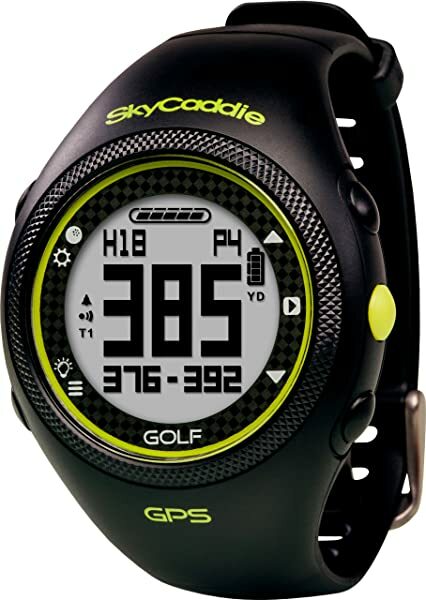 The Skycaddie golf GPS has all the essential features that you would expect to get from a watch GPS device. However, what gives it an edge over the others in the market and perhaps its biggest benefit is its accuracy. To make sure that you read the accurate data correctly it also has a very clear 1.05 inches diameter screen. Other benefits that you will get from this device is that it also allows you to use it for different things such as tracking your location, measuring lap time, speed and even the amount of calorie burned when working out. This watch is multipurpose as you can also use it for regular watch functions as it has a stopwatch, alarm, and the basic time-telling functions. Other applications include backlight, shot distance measurement and also a backlight. It is very accurate, and so you will never have to worry about not getting accurate readings. In fact, it is one of the most accurate GPS watches in this price range. Skycaddie golf GPS is very straightforward and intuitive to use, and so you can use it without any prior experience with this devices and still find it useful. Apart from the GPS feature it also has an auto hole locator that works very well and golfers will find this very helpful. For golfer looking for a stylish and functional watch then this is a perfect choice, and it has a flexible and lightweight wristband with locking buckle to prevent it from moving around. You have to sign up for a yearly membership, and there is also a fee required for the same. Due to this, it is a more expensive watch to own since other top brands do not charge membership fees. Many customers complain about syncing issues, and it also does not have the ability to sync your scores to ClubSG. Although the battery works pretty fine, it does not have a long lifespan and after a couple of months, it will only be able to take you through half the holes in a golf round. that you can use even when you are no playing, then the Skycaddie golf GPS is one of the best golf GPS watch for your choice. It has all the primary GPS and watch features and also other capabilities such as tracking your distance, speed and calories burned. The only notable disadvantage is the fact that you have to pay annual membership fees. However, the advantages that you get from the watch outweigh the demerits and hence making it a good buy for any golfer.